Although Synology's DS415+ looks almost identical to the recently reviewed DS415play, the DS415+ is targeted at the SOHO / SMB crowd. The DS415+ doubles up on RAM, Ethernet ports and processor cores vs. the DS415play and adds an eSATA port. 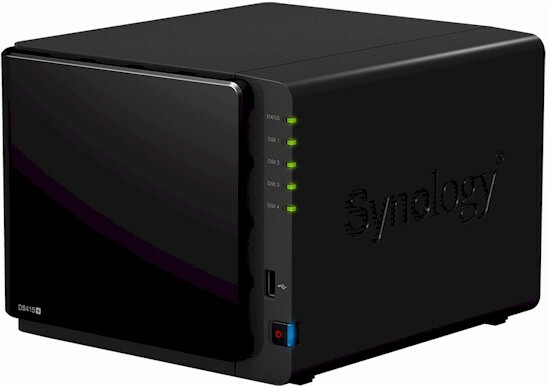 The table below from Synology's website compares Synology's 4-bay DiskStations. Note the DS415+ is the only one with a quad-core processor and an eSATA port. Below is a screenshot showing the front and rear panel callouts. The front has LED indicators for each disk, a power button and a single USB 2.0 port. The rear panel has a power connector, two Gigabit LAN ports, reset button, two USB 3.0 ports, security slot, eSATA port and dual fans. The DS415+ makes extensive use of colors and static/blinking LEDs to indicate the status of various hardware components as summarized in the table below. As with the DS415play, there wasn't an obvious way to remove the outer plastic shell without the risk of cracking it. However, Legion Hardware's review has plenty of internal photos, so we borrowed one and got most of the information in Table 1 from their review. As noted in their review, there is a single SO-DIMM slot that has the factory-installed 2 GB of RAM. While it's possible to upgrade the RAM, doing so will void the warranty. So our charts show that memory is not upgradeable. Table 1 summarizes the key components. Synology provided four Seagate NAS 3 TB (ST3000VN000) drives for our testing. Total active power consumption with the drives spun up was 36 W, dropping to 18 W with the drives spun down. The power supply is external, which reduces heat inside the case. Although the DS415+ has two fans, it has an overall noise rating of low.